sherlockholmesthegoldenyears | Totally New SHerlock Holmes Stories, Help to write Sherlock Holmes stories. Just in time for Christmas, the The Celtic Phoenix is out at Audible and Amazon. It is read by Rebecca Reed who does an amazing job. Never used a female reader before, but as this story features three powerful women, it was time. There is a great sample clip from the first chapter which, if you listen to it, will make you want to click BUY. Check it out HERE. The Celtic Phoenix launches today. This historically accurate Sherlock Holmes tale takes place in 1919, and obliges Holmes match wits with a diabolical female nemesis. He does so with the help of Tessa Wiggins, a former member of his irregular brigade. The mystery begins when a jewelry case, holding human remains, arrives at Holmes’s cottage in Sussex. To find the murderer, Holmes and Tessa must delve into ancient British history to a time when the Celts were fighting for survival. The Celtic Phoenix is steeped in the enigmatic culture of the ancient Celts—a time when the bond with Nature was strong . . . when people walked in the olde ways . . . and when women were the equals to men as warriors, priests, and poets. 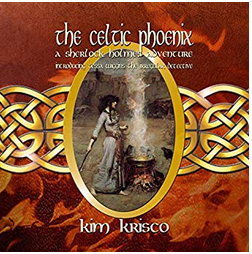 The Celtic Phoenix is the journey of three women who rise from the ashes of their past like fearsome phoenixes and shake the rational foundations upon Sherlock Holmes built his life and career. Available in paperback or Kindle, you can purchase The Celtic Phoenix at Amazon or any on-line bookstore. This historically accurate Sherlock Holmes tale takes place in 1919, and obliges Holmes to match wits with a diabolical female nemesis. He does so with the help of Tessa Wiggins, a former member of his irregular brigade. REBECCA REED just signed on to read the audiobook version of The Celtic Phoenix. She is the perfect woman for the novel as she has a repertoire of great character voices. Women readers are a rare breed, and MX Publishing and I are lucky to engage her. I nearly gave up finding a woman reader, but held out as The Celtic Phoenix is, in some ways, “a woman’s book” — with two female protagonists in addition to Holmes, and a powerful female antagonist. More importantly, it has a plot that revolves around women’s rights and issues. Hopefully the audiobook will be available before Christmas, but you can buy the book now at many on line stores — but not Amazon yet. The official launch date, and Amazon debut is December 4. BTW: You can get a 10% discount and free shipping now from THEBOOKDEPOSITORY.COM Would love to hear from you after you’ve read it. Hey! A new novel is coming this fall. Tessa Wiggins, a grown-up member of Sherlock Holmes’s irregular army, joins the “me-to” movement by joining forces with the legendary detective to tell the story of The Celtic Phoenix. Mystery becomes mayhem when a ghastly package arrives at the cottage of Sherlock Holmes, luring him out of his retirement refuge to battle forces arising out of a time before England was a country—when the Celts were fighting for their survival. Historically accurate, The Celtic Phoenix is steeped in the primeval and enigmatic culture of the ancient Celts who, more than three thousand years ago, conquered and ruled much of central and western Europe. It was a time when human beings’ connection with the Natural world was deep-rooted . . . when people walked in the olde ways . . . when women were the equals to men as warriors, priests, and poets. This is the story of three women who rose from the ashes of their past like fearsome phoenixes and shook the rational foundations upon Sherlock Holmes had built his career and life. I have a few complimentary audio downloads from Audible for the recently released: Irregular Lives: The Untold Story of Sherlock Holmes and the Baker Street Irregulars. I would need to send it via email, and if you want the special promo code, you would have to promise to do a review on Audible of Amazon of the book. If you are interested, leave a comment and a way to connect via email. IRREGULAR LIVES – Now available on AUDIBLE!!! 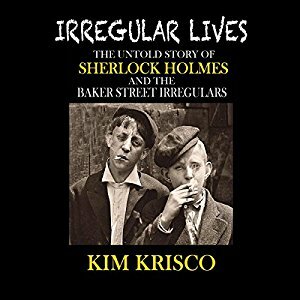 My latest novel: Irregular Lives: The Untold Story of Sherlock Holmes and the Baker Street Irregulars is now available as an audiobook on Audible. Check out a sample of Dominic Lopez’s latest creation . . . and buy a copy for family and friends. The next novel is FINALLY underway! Boy, is it hard for me to get started on a new book. I launched Irregular Lives: The Untold Story of Sherlock Holmes and Baker Street Irregulars in December — although the audiobook version has yet to begin production. But, I needed to get on to something new. For me a new book begins with a strong feeling, because, in the end, readers want a safe emotional experience. Feelings and emotion are the foundation for any story, so that’s where a writer needs to begin. Recently, what touched my heart is the power and strength of women, and what they bring to the world. For example, Sara Rose is marching in San Diego on January 21, like millions of other women in the U.S. It is looking like 2017 is shaping up to be “the year of the woman.” I hope so, because our world desperately needs more powerful feminine energy. Now it’s up to me to transmute this feeling into a story — a new novel? Sherlock Holmes – The Golden Years had a sub-theme of eugenics in its many forms. Irregular Lives is constructed around the exploitation of the poor, and the widening gap between the rich and the poor around the world. My new novel, is just twenty pages long and is not fully outlined, but one thing is clear: My next Sherlock Holmes story will have a “sub-theme” around the exploitation and repression of women in our patriarchal world. This is going to be an interesting personal journey from me, being a male of the species, but I’m looking forward to the challenge. I trust I will do the subject justice. We’ll all find out about ten months from now.